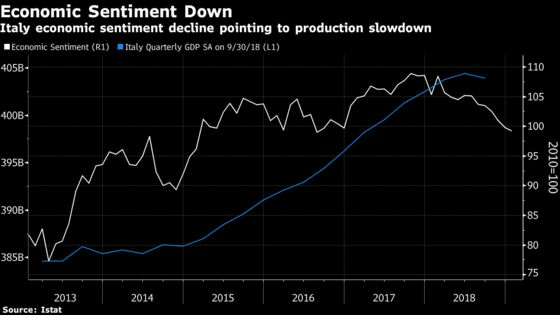 (Bloomberg) -- Italian manufacturing confidence fell for a fourth straight month amid sharply reduced economic growth expectations. The business gauge dropped to 102.1 in January, the lowest since September 2016, from a revised 103.4 the month before, statistics agency Istat said Wednesday in Rome. This month’s reading was less than economist expectations of 103.0. Consumer confidence unexpectedly rose. Istat is scheduled to release gross domestic product data for the fourth quarter on Thursday, with many economists expecting them to show Italy dropped into a recession at the end of last year. Economic sentiment fell to 99.2 in January, pointing to a possible drop in economic performance. Drop in business confidence indicators will hinder government’s push for more growth this year. Widely diverging views on 2019 growth may be leading to confusion. The populist government says it expects 1 percent, while Premier Giuseppe Conte says he is “confident” it could reach the originally targeted 1.5 percent. The Bank of Italy and International Monetary Fund both forecast 0.6 percent this year. Populist leaders are already gearing up for European Parliament elections in May, adopting a hardline stance on key issues to boost their voter appeal and divert attention from the economy. Istat’s confidence survey was conducted in the first half of this month. Confidence gauges for the full 19-nation euro area are scheduled to be released at 11 a.m. in Luxembourg. Italy has suffered from years of near-stagnation and the European Commission says it expects the country to have the slowest growth rate in the 19-nation euro region this year and next.